UN welcomes migrant centres deal Jump to media player The United Nations has welcomed a deal between the European Union and Balkan leaders to manage the flow of migrants into Europe. 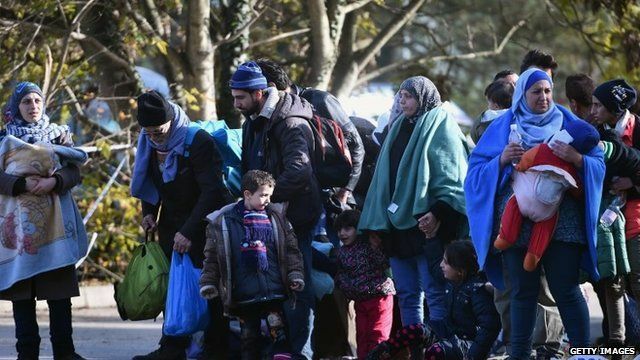 Leaders meet for EU migrant crisis talks Jump to media player Several leaders from Balkan states are meeting in Brussels to discuss new plans to ease the migrant and refugee crisis. 'Immense queue' at Croatia border Jump to media player The BBC's John Sweeney, on the refugee trail, searching for a young Syrian boy he met who has disappeared, reaches the Serbia-Croatia border. Migrants 'dumped' on Slovenia border Jump to media player Leaders from central Europe and the Balkans are going to meet to discuss how to coordinate their response to the migrant crisis. How is Slovenia coping with migrants? Jump to media player As Slovenia prepares to deploy its army to deal with number of migrants, Guy Delauney and Nick Thorpe report from border towns to the north and south of Slovenia. Migrants 'stuck in no man's land' Jump to media player Tensions are building among thousands of migrants trying to reach Western Europe via the Balkan states, as new border controls come into effect. What happens to migrants in Germany? Jump to media player Over the past few months, thousands of migrants and refugees have been travelling to Europe. Leah's travelled to Germany to find out what happens when they get there. The United Nations has welcomed a deal between the European Union and Balkan leaders to manage the flow of migrants into Europe. The agreement, signed on Sunday, provides for 100,000 places in reception centres, as well as extra police and other measures to secure EU borders. Ed Thomas reports from Lesbos on the likely impact of the new deal.